Our mission is to develop the whole child. This not only requires rigorous academics, but must also include the integration of a comprehensive arts program. Unfortunately, resources are wildly limited within the Chicago Public School system, making it difficult to adequately provide the type of rich and engaging arts programming that ALL students deserve. Fundraising, grant writing, and massive hours of volunteerism by a handful of seriously involved teachers and parents. $350-$500 for a school assembly (for 1/2 of the students) featuring a story teller/musician, a Latin Music expert, African percussionist, or a dance troupe. That's just a random sampling and approximate costs for programs/items provided to Skinner students through Gallery 111. Not that we're suggesting you give only a little bit... we're terribly thrilled to receive the BIG BITS too! April 16th in school performance of Dr. Doolittle by Emerald City Theatre. Grades K through 4. Poetry Workshops for 3rd and 5th grades implemented by poet Laura van Prooyen. Secured slot for complete Hands on Stanzas program for 2nd & 5th grade classrooms for next school year! 14 classrooms received 5-session artist in residency programs for our classical and special needs students in grades K-8; covering puppet and mask-making, dance and visual art. A trip for grades k-2 to The Vittum Theater to see The Rabbit Man’s Tale. A six week percussion class March. 7 session Visual Artist in Residency with artist Nicole Beck for kindergarten rooms and second graders. American Songbag Touring performance at Skinner for all students grades K-4. Chinese Folk and Classical Dance touring performance at Skinner School. Fiesta Mexicana touring performance at Skinner School. Parent printmaking workshop led by Francine Affourtit. Below is a list of some of the most generous, creative, and slightly insane folks we've ever had the pleasure to meet. Without them, No Art Left Behind would be just marshmallows around a campfire. We love them all. Please visit their websites (where available) and enjoy. Skinner is a Classical School, which basically means our students perform a year above grade level and therefore, do very well on their state assessments. Because of our high test scores, Skinner receives very little discretionary funds. Yes, our students are actually penalized for a job well done! The small amount that comes our way pays for the necessities, books and very basic school supplies. That said, there is nothing left to help fund our arts education. Many of you have heard about the tremendous budget cuts that will be affecting The Chicago Public Schools next year. It is our hope and the hope of our very talented students that Skinner's art program will not be cut. To ensure that, No Art is Left Behind at Skinner, we are asking for your help. 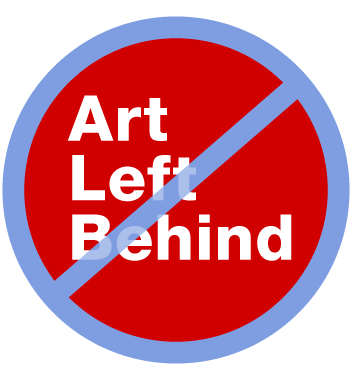 May 14 marks Gallery111's eighth annual No Art Left Behind fundraiser at The Catalyst Ranch, 656 W. Randolph Street. We are hoping that you will consider attending the event, donating an item for our silent auction, or making a monetary donation. Feel free to pass this information along to any friends who are passionate about arts education.